BOB ABERNETHY, anchor: Now a story about a man who once lived the glamorous life of a movie executive but gave it up to help the poorest of the poor — little children in Cambodia. His name is Scott Neeson. SCOTT NEESON: He basically found his own way down to the dump where he was living on his own. 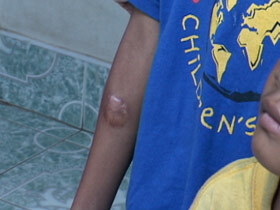 You can see he’s got a lot of scars on his arm. But he was a professional garbage picker surviving on his own — picking up the rubbish, living day to day. LUCKY SEVERSON: Like the scar right here? Mr. NEESON: Like the scar right here, yeah. SEVERSON: What would that be from? Mr. NEESON: It would be a burn. 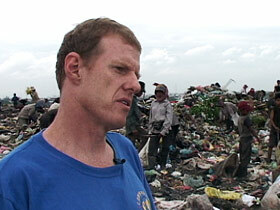 SEVERSON: Scott Neeson found most of his kids at this mountain of garbage outside Cambodia’s capital city of Phnom Penh. Pictures alone don’t do it justice — don’t reveal the stench, the filth, maggots, the chemical waste, and sharp, jagged objects. Mr. NEESON: When I first came here, I had nightmares. I had terrible dreams for a week or two afterwards. And I think some of the things I’ve seen out here are just horrendous. SEVERSON: This is home and the workplace to hundreds of little kids and over a thousand families. Mr. NEESON: They live day by day. They go and they pick up the rubbish. They get enough for food and do it all again the next day. SEVERSON: Neeson first came to Cambodia in 2003 on a backpacking trip. He couldn’t get over all the homeless kids, begging for a handout. Neeson gave them money and paid for schooling, but within a week many parents had spent the money and pulled their kids out of school so they could work. Mr. NEESON: And in the water here you’ll see them washing and doing their laundry. SEVERSON: Neeson says he found himself moved by the horrific circumstances of the young kids. It was an extremely different world for him. He had just left his position as president of 20th Century Fox International and accepted a top job at Sony Pictures. Mr. NEESON: You know, it was a really glamorous life. You know, I had the Porsche. Yeah, a five-bedroom home that was worth a few million dollars. I had the Porsche and a big old boat. SEVERSON: You were a man of means? Mr. NEESON: I was a man of means and luxuries. And yet — I sort of enjoyed it, but I wasn’t particularly happy. SEVERSON: Neeson decided he would honor his commitment to Sony Pictures but returned often to Phnom Penh, where he started the Cambodian Children’s Fund. For many kids, it’s a live-in school where they attend classes by day and learn about their culture by night. Some spend their nights at home. Ally Hoffman came here on a visit and returned to be Neeson’s assistant after she graduated from the University of Southern California. ALLY HOFFMAN: There’s room and there’s a bed and, you know, soup in the pot, and that just changes their life, in minutes sometimes. I tell Scott that I can tell who’s been here longer because it’s almost like watching something flower. SEVERSON: Scott made the decision to move here permanently after he received an emergency call from his staff in Los Angeles. Mr. NEESON: And my phone rang, and it was my office, and the actor who was on tour was having quite a serious meltdown because the private jet didn’t have the right amenities for him. And he wasn’t — he didn’t want to get on the jet. The whole tour was in jeopardy. And the quote that their life wasn’t meant to be this difficult is what they said to me on the phone. And I thought, I don’t want this to be my world. This isn’t my reality anymore. Oh God, this is one of the heartbreak ones. She spent two months at the school, and then her mother took her back because she was losing income. SEVERSON: On this particular day at the dump, he was relieved and elated to find a 12-year-old girl named Tola who had attended his school. Mr. NEESON (To Tola): You’ve got the best smile in this area. SEVERSON: After a few months, Tola’s mother wouldn’t let her attend school anymore — said she needed her to collect scrap metal so she could put food on the table. Mr. NEESON: I went seven times; I was at her house, banging on the door, because Tola didn’t show up. SEVERSON: He found her mother at the dump and began intense negotiating to get Tola back in school. Finally, they reached a deal that the parents would allow Tola to attend school for at least a few months. Channoeurnh Sok helps at the school and says Neeson would never turn any child away if he could avoid it. CHANNOEURNH SOK: Scott really wants to help all the children that he sees. Yes, and he hoped to have all of them. He said he will save the world if he can. SEVERSON: So far, the bulk of the money he has spent has been his own, but eventually that will run out. He’s been getting some help from his old buddies back in Hollywood. 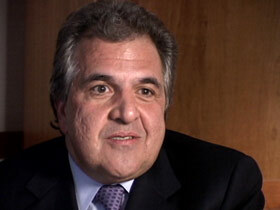 JIM GIANOPULOS: He represents what so many of us would aspire to. SEVERSON: Jim Gianopulos, the chairman of Fox Filmed Entertainment, sponsored a fund raiser for the Cambodian Children’s Fund. Mr. GIANOPULOS: The notion that you can give up this life and the cars and the houses and the glamour and all the trappings of success — particularly in this industry — to just give it all up and do something really meaningful to people that really need it is, I think, something that all of us feel that we, hopefully, feel that we have the nobility and capability of doing. But few of us actually do it. In fact, I don’t know anybody that’s doing what Scott’s done. Mr. NEESON: It was always eating away at me. At some level I was always just a little bit discontented. I could never quite put my finger on it, but it never seemed like it was me. I’d no idea this would be the other extreme. SEVERSON: Neeson says he doesn’t belong to an organized religion but leans toward Buddhism, in part because it accepts suffering as part of life and has helped the kids endure their own suffering. Mr. NEESON: And the one thing it’s really taught me, even more than, I think, spirituality, is the resilience of the human spirit. What these kids have been through is remarkable, and they come here, and they have a sense of real happiness. Sling Chuk comes from Sung Mean Chi. She was a garbage picker — again, a fairly violent household. SEVERSON: Neeson says when he finally marries he’ll be much better prepared for fatherhood. As it is, he knows the life story of each of his 118 kids. Mr. NEESON: He’s a wonderful boy but he’s had a terrible couple of years. He’s lost his entire family — his brothers, sisters, and mother and father — all in the last two years. Saih Nik here was a garbage picker even though she’s tiny. She was four when we found her. She just turned five last month. 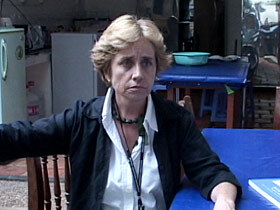 SEVERSON: Marie Cammal has been working with homeless children most of her life. She says what Neeson is doing will make a difference. MARIE CAMMAL: Because when you change the life of one child of Cambodia, in Cambodia, that means you save at least two or three generations ahead. You give education to one boy or one girl — that means this boy and this girl will have a better job and will feed 15 people in their family, within their family. Yes, but we need a lot of guys like him. SEVERSON: He keeps in close touch with parents of the kids at school. This family smiles and welcomes him to their humble home, complete with squealing pigs and swarming flies. Much to the delight of Neeson and everyone else, including Tola, her nervous father gives his permission, his thumbprint pledging not to pull Tola out of school for at least a few months. Mr. GIANOPULOS: You know, we all want to change the world, and when we approach that effort and try and implement that desire, you know, you realize it is very difficult to change the world. But what Scott has done has changed a little piece of it and completely changed it for these kids. SEVERSON: His friends keep asking him when he’s moving back home. He says for the foreseeable future, that’s not an option. Mr. NEESON: There’s no going back. I mean, what would happen here with 117, 118 children who are going through the process of changing their lives? They’re trying their best. I mean, how do you just walk away from that? Do you put them back in the streets? Do you just forget about it? I didn’t realize the permanency of what I’d started here until relatively recently. SEVERSON: Even though the school has all the kids it can handle right now, Neeson still keeps a close eye for kids at the dump who are especially vulnerable. Meanwhile, he’s looking for the ways and means to care for more kids.